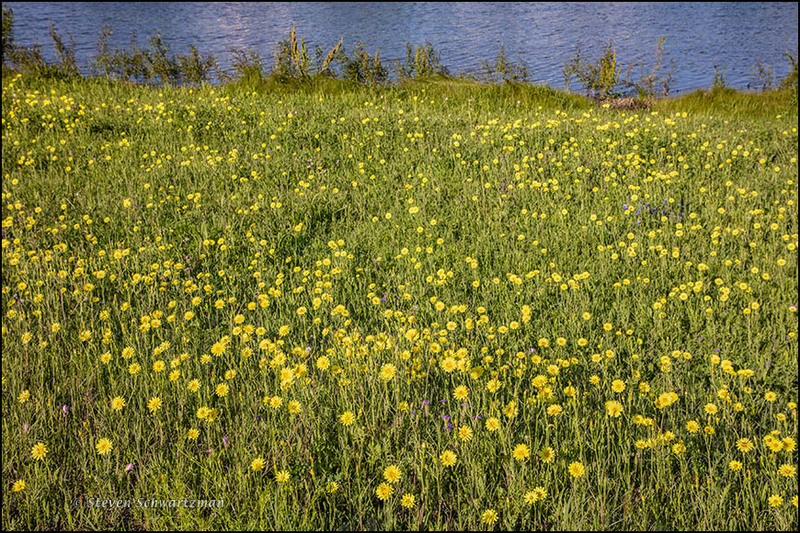 Behold a colony of Texas dandelions, Pyrrhopappus pauciflorus, flowering near a pond on the Blackland Prairie in northeast Austin on April 16th. This wildflower has occasionally been called a false dandelion because it’s the true one here. 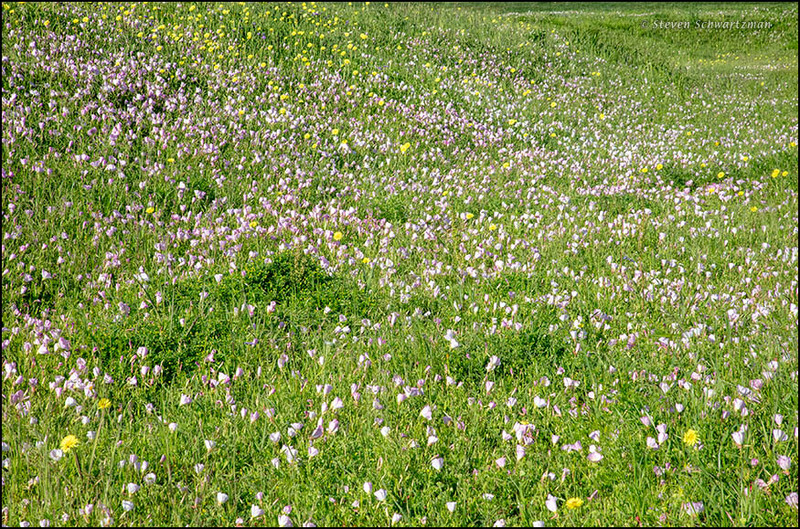 There were parts of the site where pink evening primroses, Oenothera speciosa, outnumbered the Texas dandelions. There is a holy grail plant here called prairie false dandelion so I just looked it up to see if it is the same thing but it isn’t; it is Nothocalais cuspidata, and only is seen in our driftless area in the NW corner of Illinois. That is a beautiful and unique area you and Eve might enjoy. Interesting that you call it a holy grail plant, which I assume means it’s rare. It didn’t occur to me that there’d be a region that far north that escaped glaciation. Botanists speak in hushed voices when they talk about this one, probably because to find it would mean you’d found a very rare, very high quality relic prairie. I discovered the driftless area a few years ago and was enchanted. Like you, I’d assumed that all of Illinois got flattened. Incidentally, when I was in college in the early 80’s my professors would talk about global warming, and how if it continued it would ultimately cause the slowing down of the gulf stream. Darned if that isn’t exactly what is happening! That, they said, could trigger another ice age. So how does triggering another ice age jibe with current forecasts of melting polar ice and the rise of the seas? I do hope you find your prairie dandelion and relic prairie. That is the question. They were drawing on the historical record of what happened before the last ice age. But at that time of warming, of course, there weren’t humans running around burning fossil fuels so I can’t imagine it will turn out the same way. Haven’t the coastal areas of Europe been experiencing colder temperatures? It is a feedback loop. If the Gulf stream isn’t bringing warmer water up from the equator, summer temps never get really warm in the north and so the snow from the previous winter never fully melts. This sets the stage for the next winter, which is then colder and so on. That would be a good thing, I think. There are good articles about how the melting waters dilute the salt of the ocean, which contributes to the slowing of the gulf stream. Yes, or at least, changes in things we’d thought immutable. Nothing is immutable except change. Both beautiful swaths of flowers. Very nice shots, Steve. That place was looking unusually good this year. I think it’ll stay intact as a greenbelt. In contrast, the larger property across the road, where I took pictures several times, has recently become an apartment complex. More and more of what was left of the Blackland Prairie is disappearing. Yes, over the past 5 years, probably 20 properties where I’d taken pictures have gotten developed. I’ll always remember them the way they were, and my photographs will be testimonials of things that once were. Something the Texas dandelions and pink evening primrose have in common is their willingness to thrive and spread in urban areas — even in areas that are regularly mowed. At the yacht club where I often work, which is obsessive about “neatness,” they can’t stop those flowers. They often combine, too. The vacant lot across from me has both flowers in roughly equal amounts, and they’re just delightful. They scalped that lot with mowers two or three weeks ago, but now the flowers are back. I like the way you put it: scalped. We have to be thankful for any wildflowers that grow low enough to survive the mowers, or at least to bounce back quickly. Can’t remember if I’ve seen such a good combination of these two species in other places and in other years. The fact that you have will make me keep my eyes open for more. False dandelion? Why can’t it just be Texas dandelion or American dandelion. The toyon used to be known as California holly, even though it is not related to holly. I suppose it is funny that plants are named after other more familiar plants. Perhaps toyon should have been known as ‘true holly that all other hollies (especially snooty English holly) aspires to be’. The term “false dandelion” arose among people who came here from Europe, or their descendants, who originally knew only the Eurasian dandelion. For those people, that was the real dandelion, so when they encountered a similar-looking species here, they referred to it as a false dandelion. As you pointed out, sometimes the resemblance was farther afield, even to plants from different botanical families. Then, through repeated usage, the inappropriate names got established and are often difficult to undo. Look at pineapple, which isn’t an apple and doesn’t grow on pine trees. Ha! Exactly. Although, ‘pine’ refers to that genera, and ‘apple’ refers to the fruit of it, even though it is not really a fruit. Lime here is a citrus, but lime elsewhere is a linden. Well, there is a long list of weird names.